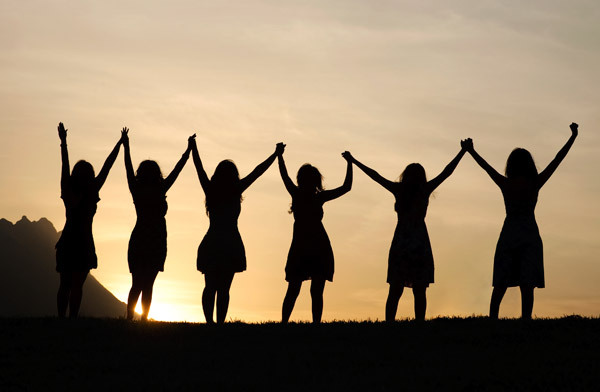 March is Women’s History Month, and March 8th is celebrated as International Women’s Day all around the world – a day when we should honor the women in our lives, and the women who have made contributions to our society. Today I received an email from a good friend of mine in North Carolina talking about the day, and her thoughts about Women, and Women’s History Month. I enjoyed reading what she had to say, and with her permission, I share it here with all of you. Yesterday I did a Women’s History Month display at the bookstore, and I played around with images of women’s work – our display includes a kimono and an apron, a cast iron skillet and a six foot pole-ax, a Goddess of Willendorf and a plastic Witch. There’s a tiny box of chocolates and a mug shaped like a round naked woman in the color of the sea. Today I’m blessed to be at home, working on a talk about the rise of Goddess spirituality that I am giving at our local university next week. I am spending this International Woman’s Day soaking in the remarkable work that women are doing in the world and delving into the history of the work we have done throughout time, work without much recognition. I’ve already been asked when “Men’s History Month” is and been told that men are as wounded in our culture as women are – where’s my compassion for men? As a priestess of a Goddess, people frequently take me to task for not honoring the Divine in male form, too. Where’s my sense of balance? I acknowledge the fear and pain in these queries that seem like attacks, but I have no short answer. I am a woman, and I love the circles of women who are moving and changing the world and meeting in secret and meeting in public all over the world. Here in the United States women didn’t get the right to vote until my grandmother’s lifetime, within living memory for a select few elders. Women didn’t have the right to choose the profession in which they might excel for many more years here, unless they chose to be teachers, nurses, secretaries, or homemakers. The world is different now and it is changing fast. Women in many spiritual traditions are re-imagining their religions in new ways, forming their own circles, stepping forward into positions of authority. This can be threatening because change can be threatening. But I choose to see us as mid-wives…boiling water and bringing ice-chips, panting with the Old Earth as she births herself anew. Perhaps I am a little dubious of “Woman’s Day” as I am dubious of “Earth Day” because in my heart and soul I celebrate women and the Earth every day. But since we are sitting here on International Woman’s Day, I want to take this opportunity to bless all the children of women, wherever they are and whatever they do. I honor them and I honor their mothers and their grandmothers, and the way in which women work to heal and make connections and weave the strong web of change. May they be blessed with abundance in all things – in love and grace and power and wisdom. And may they bless us by passing those things on. Byron Ballard – writer, mom, Wiccan priestess – lives and works in the ancient mountains of Western North Carolina.